I was revising my evangelism teaching notes and came across an old article about ‘deconversion’. This article has always struck a cord with me and I thought it was about time I shared it with you. It’s long, but worth it. I can no longer get in contact with the orginal author to get personal permission. But I have noticed it is now scattered throughout the wonderful land of public domain on the net, so I hope it is ok (if it’s yours, please email me). The late fall afternoon is peaceful as I cozy up on the sofa for a few hours of cable television movies. Flipping through the channels, I happen upon a prerecorded televangelist rally. I pause to observe. The small man on the stage shouts into his cordless microphone about the power of God and the salvation of Jesus, stomping up and down the length of the stage, visibly energized by the clamorous feedback of his audience. Although the program is nearing its end I know he has been performing in this manner for about an hour. He concludes his sermon with an emotional prayer backed by a solemn minor-key melody on electric piano. I watch then as hundreds of people stream from the arena seats to the stage, seeking salvation in the small man’s invitation to become “born again.” There are close-ups of teary-eyed individuals with upraised arms, singing and praying, overcome by joy to have finally found salvation. For several years I believed my experience to be unique. In time I met another person who had defected from the ranks of Fundamentalist Christianity; then another, and others still. I am now convinced that the number of Americans who have had a “deconversion” experience of some type is much greater than one would suspect. Deconversion is currently an under-studied phenomenon which could provide an important perspective from which to understand religion in America. The specific psychological, sociological, cultural, and political implications of large numbers of religious deconverts are beyond the scope of this paper. Nevertheless, it is important to understand that deconversion births as radical a psychological shift as the original conversion experience. It is quite enough to impact American culture and religion, just as conversion experiences produce “born-again” Christians who impact American culture in clearly manifest ways. Surprisingly, the testimonies present only two key factors in their authors’ deconversions. The first is related to external circumstances, including the behavior of other church members, leadership, or the denomination. The second is wholly internal: church doctrine simply becomes untenable. Another interesting aspect of the deconversion experience is that it is largely involuntary. Not one of Leaving the Fold’s contributors relates a process in which he consciously decides to leave the faith with deconversion as a goal. The testimonies are of those who set out to find their answers in an effort to maintain their faith. Only grudgingly did they come to accept that the answers for their questions were to be found outside church doctrine. In various ways each describes how he was forced by intellectual honesty to face his discoveries. It may seem surprising at first to think of deconversion as an involuntary act. However, I would point out that the initial experience of being “saved” is very often itself involuntary. Converts are generally not provided with all the facts necessary to make an informed decision. Instead, revival meetings and proselytization efforts are engineered to create a specific vulnerable emotional state within the target. The convert is then manipulated into accepting whatever religious message the evangelist has to peddle. Individuals converted by such deceptive methods have not voluntarily chosen to convert; they have been coerced. It is a difficult thing to accept that one has been duped. No one chooses discover that he has been lied to. I could spend hours talking about this one person’s experience! But truthfully just talking about it would not be doing him any justice. We need to feel the weight of some of his conclusions. I would like to offer you some of reflections and hopefully hear what you think. The author states the ‘deconversion’ experience often starts with just one question, and then a group of questions. I ask you: who hasn’t experienced that before? One experience can lead to a change in paradigm which then leads to a complete change in how we go through the selective sensory process. For example, as a result of reading this article on ‘decoversion’ experience and trying to play an active role in talking with these ‘deonversion’ guys online, I have changed the way I go about evangelism… I am no longer interested in coercing an emotional response. While that may not sound like a big change at first… but just stop for a moment and think about it, how much of your evangelism efforts were or are focussed on getting an ’emotional’ response from the other parties? I’m not interested in getting them to pray the sinners’ prayer, the sinners’ prayer is not some magical words, the effectivness in the ‘sinners’ prayer’ rests in the God to whom the prayer is offered… I am more interested in being the type of person who gives someone the chance to talk to God and to ask the questions which have plagued them. I want the person to be able to be free and honest with God. Strangely enough I have seen a common thread amongst the ‘deconversion’ crowd and we can all see it in the evangelism process. The common question or common questioning is, ‘What about those people?’ ‘What about the people who never have the chance?’ ‘What about those people who have been completely neglected?’ ‘What about those people who have been sincerely and wonderfully compassionate… but sincerely wrong?’ This in my experience is just the surface of the questioning, but if you scratch a bit deeper it leads to something even more profound. I’ve often missed that deeper underlying value to the question. These people are not asking for a right and wrong, a true and false, a theological explantation… they simply want to know… does God love! Is God love? How do Christians react to that question? How have I reacted? Perhaps indifferently? Perhaps defensively? ‘I am sorry Jesus is the only way’. What ends up being communicated most of the time is that Christians are the least caring people on the face of the planet. Because somehow we turn it into a which religion is right? These people do not care ‘which religion is right’. All they want to know is: can God really be there with those who are hurting? They want to know if He is close. I will stop it there and see if anyone is interested in taking this discussion further. I do have more to say on the subject but won’t other unless you’re interested. I was interested to note that the ‘decoverted’ all felt like they had another experience of being ‘born again’, yet again… i have felt that same way- i chose to think of it as being ‘re-born again’ because the freshness and newness that came to me from the Spirit of God could not have come from the wooden,stale religiosity i had been shown how to live. I thank Him every day for the freedom that has come to my own spirit and know that there is a real life of faith for me in Christ day by day. You may not know that you posted the above piece (mentioning me by name, along with the book I edited) on my birthday, which is Sept. 15th. Nice little present. Thank you! Far better than a card in fact. 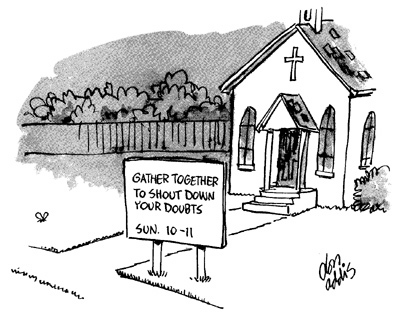 I also applaud your rejection of the technique of attempting to “coerce an emotional response” when it comes to evangelism, and doubly applaud your invitation to people “to be free and honest with God,” though in human terms that is also an invitation to be “free and honest with you.” I am assuming that both you and God applaud such honestly. By the way I have remained an agnostic since editing that collection of first hand testimonies, and I accept that many people’s beliefs on all manner of subjects might not change much during their lives. I believe for instance that you believe what you say you believe. And I applaud your effort to understand that others also believe what they say they believe. The only real difficulty comes in when one introduces the idea that the Bible and science and history are all clear on the existence of a Higher Power, a personal Higher Power, a classical theistic Higher Power, a Trinitarian Higher Power, who inspired a collection of writings that is to be viewed as lying above all other writings on earth, and if someone fails to agree that such matters are clear or convincing, that someone will be “damned” in some fashion for all eternity without recourse to mercy, further learning, or anything else, except damnation. thanks for taking the time to post Edward and Happy belated birthday! I am not sure if you want to get in any further discussion and I don’t want to push it! I don’t have any real difficulty when it comes to Bible and science because I don’t see it as my role to try and convince anyone. For too long Christians have been more interested in defending God… defending God through debates such as science and history. I would rather spend my time proclaiming God, by that I mean I do my best to act as God would act, to feel as God would feel, to love as God would love. ‘Jesus said if He be lifted up He will draw all men’ He didn’t say if people would be convinced of the bible, valid scientific proof, or even historical evidence. This change in my life has made a world of difference and I am not sure how to explain it, but I will wait to see if anyone is interested in continuing the conversation. We all want to be loved and also understood, at least partially. And I applaud you for going the extra mile in that respect. I also agree with you that getting along with people, even loving people with different beliefs is an ideal we’d all like to see practiced. I think we might disagree that the task of understanding the Bible understanding God are both something that is so axiomatic that one can speak confidently of “doing one’s best to act as God would act, to feel as God would feel.” I don’t doubt that you love God and love your fellow man and wish to show him “the love of Christ.” It’s axiomatic for you that you even speak in such a fashion. But why not just be a human being and say we have differences in belief and that you honestly don’t know what more you can do to bridge those differences except treating me humanely? What if a person does not feel as you do concerning “the love of Jesus?” I no longer connect with the image of a bloody savior preceded by centuries of animal bloodshed. For instance I watched the film The Passion and found the most moving part the way Jesus’ mother wanted to grab him after he fell with the cross, because she flashed back to when Jesus was a child and he fell and she ran to embrace him. That scene was the most moving in the entire film in my opinion because it was both universal and sincerely human. But the bloody hour long spectacle of one man in Palestine being beaten up did not move me except as an inhumane act of torture of which I could have stood to see less, or which I have seen all too much throughout human history. I don’t need to see that kind of activity for an hour to know that people have suffered at each others’ hands ever since humans have had hands (even as far back as when pre-human primates hadn’t evolved opposable thumbs, they were still beating and biting each other). So, what may have been to a Christian a beautiful demonstration of God’s love for humanity was to me a bit like watching a snuff film with buckets of blood. Neither do I see exactly how torturing a human appeases God’s wrath. Why so wrathful in the first place? Nor do I see or feel that my own faults or imperfections demand a beating to death or a blood sacrifice. Neither can I imagine how such a sacrifice functions. It seems to function on the level of parasympathetic magic. And I can’t begin to imagine a Being that would hold me accountable for not falling in love with one particular orthodox version of one religion, especially since people disagree on everything from the religion they love most to the people they love most to the songs they love most to the flowers they love most. But getting back to your desire to “act as God would act” how exactly does that function in terms of the cross? Do you feel the need for a blood sacrifice whenever you are offended? Again, on the topic of acting like God, the Bible says that God simply forgives. In fact Jesus said to pray in this way, “Forgive us our trespasses as we forgive those who trespass against us.” I already do that. I forgive others who have trespassed against me or offend me. Likewise, I imagine a God who would forgive me without a blood sacrifice, just a cooling of wrath. It might take a while, but people do cool down. Also, have you considered that maybe the question of what constitutes “God’s love” isn’t spelled out quite as clearly as you currently assume? You are the one picking the choosing verses in the Bible. And the Bible is big and there’s lots of verses to choose from. For instance, some theologians reject or downplay the penal theory of atonement in favor of the Christ victor and Christ exemplar interpretation. Let me [God] alone that my wrath may wax hot against them. That the Lord may turn from the fierceness of his anger. He made Israel to sin to provoke the Lord God of Israel to anger with their vanities. Or consider this teaching, “He who does not believe is CONDEMNED ALREADY.” John chapt 3. In Galatians 1:8 Paul curses any man or angel who dares to proclaim a contrary gospel. Paul even proclaims in 1 Cor. that “many of you are ill and some have fallen asleep [died]” because of God’s “judgment” on how they were celebrating the “Lord’s supper.” Paul was certain that God was making “many ill” and even murdering/executing some Corinthian Christians whenever they got out of hand celebrating the “Lord’s Supper.” Perhaps Paul thought God was punishing his own people just like He did in the days of ancient Israel when He sent them plagues or murdered them. That’s all part of “God’s love,” no? Even in the NT? In 2 Peter 2:1 “swift destruction” is prescribed for all false prophets and teachers. I am most aghast at the verses in which Jesus proclaims that family means less than nothing compared with becoming a member of God’s family. Jesus sounds like a cult leader in those pronouncements. A leader of the children of God. Save your soul, care not for those who don’t listen to your message, wipe your feet and move on, care not to bury your dead father, care not for family, for wealth, give all to the poor (which soon became in Acts “give all to the community of believers”–and may God strike you dead if you lie about having given all your savings to the community of believers–as in the case of one husband and wife who were both struck dead by God for lying about having given their all, apparently they lacked faith and held back some of their money from the community). And then there’s the book of Revelation in which Jesus and God finally bring “peace” to earth by spewing out everyone who is lukewarm and destroying anyone who follows “the Beast,” which includes, “the whole earth.” Nice way to bring peace, by first releasing hell on earth. I hope you will consider the above questions concerning what “God’s love” entails. I know there are plenty of Christian theologians of different persuasion with whom you can discuss the verses I mentioned. Certainly Catholics, Lutherans, Calvinists, Armenians, Open Theologians, as well as Hell raisers, Annihilationists, and Universalists, haven’t gotten together on such questions for centuries. Neither does it appear likely that they will. They will continue to agree to disagree just as you and I most likely will. Ok here goes Edward I apprecriate you taking the time to talk with me about this. “We all want to be loved and also understood, at least partially. And I applaud you for going the extra mile in that respect. I couldn’t agree more with you on this matter Edward. One of the things I found most uncomfortable about church was the unspoken model which characterizes the church; Become or Behave – Believe – Belong. If you behaved in a certain way and if you believed in a certain thing, then and only then could you belong. It wasn’t until I really came to grips that us mere mortals have this inbuilt desire to be known, to love to belong. I am now working at planting churches which are characterized by Belong – Believe – Become. This change automatically in my mind should make the churches far better examples of Christ. But please don’t get me wrong, I am not ruling out the importance of ‘correct’ belief, but I hope I am just getting the focus sharper. The focus being the person of Jesus not just ‘correct beliefs’. I would like to think Edward that my choosing to live in such a fashion would be axiomatic of God and the bible. I understand humanity in terms of being proof of God. I choose to live this way because somehow I was made to live like this. I can see your point here Edward and I while I agree I would also like to add that if I believe ‘I was made to live in that humane fashion’ then I had better do so or I would not have lived to my full potential! Christians should be held to the highest standard on this, but unfortunately this is not always the case and so I can only apologize when I don’t display that humane character and hope that I would find acceptance despite my shortcomings. “What if a person does not feel as you do concerning “the love of Jesus?” I no longer connect with the image of a bloody savior preceded by centuries of animal bloodshed. For instance I watched the film The Passion and found the most moving part the way Jesus’ mother wanted to grab him after he fell with the cross, because she flashed back to when Jesus was a child and he fell and she ran to embrace him. That scene was the most moving in the entire film in my opinion because it was both universal and sincerely human. I must admit here to Edward that I also had trouble watching the film because I couldn’t help but think of all the human elements in the scenes. The moment when His mother sees Him fall, I can’t but help to think how I would feel if my own kids had fallen and I was unable to help. I find things difficult enough, hard enough to grasp that I don’t wish to be reminded anymore of those things which happen in this world which are horrible, unfair and unjust. I too cannot understand the harsh nature of the cross, and I read that Jesus also did not want to go through with it when He cried in the garden ‘Father if there be any other way’. But one thing I do know Edward was I am glad He did end up saying ‘never the less, your will be done’. This is where the heart of the matter is for me Edward. I definitely don’t desire to have any blood spilt. But I also recognize that if I choose to live a life like Jesus then I too could expect to die ‘unfairly’. I want my life to be a life in which I pick up the cross daily, it means I should consider others above myself. The cross does not mean a life of safety it means a life which is often lived on the edge. The adage I think most churches I have been involved in is ‘the safest place to be is the centre of the will of God’. I can’t help but think how did I get that so wrong! The safest place to be in is the will of God! Ha tell that to John the Baptist or to Paul. The cross means I ‘function’ living as though He is worth it. It does not mean I ‘function’ in a way which says ‘come to Jesus He will make things right’. He may not make things right, my life may literally be torn apart. I may die of cancer before my kids grow old. But I hope I pass onto them a desire to live life to the fullest and you do so by living a life like Christ. On this point Edward I would like to thank you. So many I people I speak to about this sort of thing speak so violently out of some past hurt or injustice. I don’t know anything about your past but this comment leads me to believe that you have a deep sense of ‘personal awareness’, which enables a person to talk about these things in a thought provoking manner! “Also, have you considered that maybe the question of what constitutes “God’s love” isn’t spelled out quite as clearly as you currently assume? You are the one picking the choosing verses in the Bible. And the Bible is big and there’s lots of verses to choose from. For instance, some theologians reject or downplay the penal theory of atonement in favor of the Christ victor and Christ exemplar interpretation. Thanks Edward you have quoted so many passages here, and I know that there are others, so I am unsure how to continue here… should I look at each one and reply to each one? Or should I just look at one or two? I am open to suggestions? I do see some great profit in talking about at least some of them!